Maybe it’s because we’re all attached to our region’s rural past, so imprinted are we with our grandparents stories, we can’t stop thinking or writing about it. Or, the issues that dominate conversation happen to be in our rural quarters, like mining, mountain top removal and ameliorating poverty. Maybe it’s because there are few universities that offer urban studies. Virginia Tech’s Department of Urban Affairs and Planning is the only one I’m aware of. It’s an irony, really, considering that we are, in fact, urban. 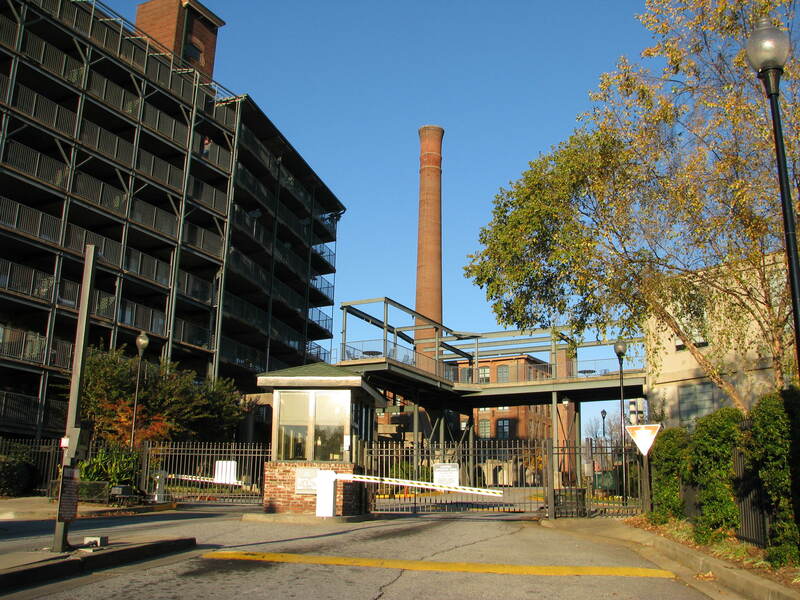 An old mill that once employed hundreds of Appalachians in Atlanta's Cabbagetown neighborhood has been converted into chic condos and lofts. Almost 60 percent of the region’s 24.8 million people live in urbanized areas, and if current demographic trends hold, that number will increase. The feds define Appalachia as a 205,000-square-mile region that follows the spine of the Appalachian Mountains from southern New York to northern Mississippi. Within that span, there are larger cities with more than a 100,000 people, like Birmingham, Huntsville, Chattanooga, Knoxville, Asheville and Pittsburgh. And, there are dozens of medium-size cities like Greenville, S.C., Charleston, W.V., and Scranton, Pa.
Close to half the region’s population lives in the north, with more than a quarter in Pennsylvania alone. Cities like Youngstown and Pittsburgh share cultural and economic bearings with cities in the industrial Midwest grappling to transition into the global network economy. The southern end of Appalachia is growing fastest, particularly counties of north Georgia, thanks to Atlanta’s influence. There, communities face challenges like loss of open space and overburdened infrastructure. All of Appalachia’s cities, like all of America’s, are shaped by the countering forces of sprawl, which moves people out, and new urbanism, which draws them back in. The latter has breathed a new life into so many Appalachian city centers. 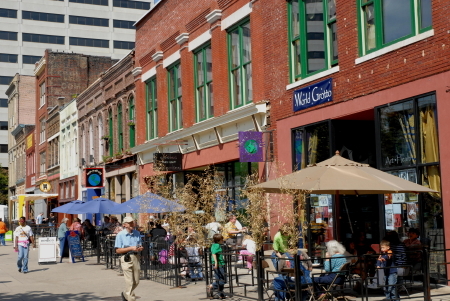 Knoxville, Roanoke and Pittsburgh all had spots in Planetizen’s list of top 100 public spaces, an indication of the urban-loving lifestyles that flourish there. Asheville’s property values have ballooned as the city’s popularity grows, Chattanooga has been completely transformed by extensive revitalization and Greenville is lauded for its walkability and charm. Even my hometown of Kingsport, Tn., which was ghost town quiet in my youth, now boasts some hip restaurants, a pedestrian greenbelt and upscale loft apartments. That rejuvenation, that urban awakening in our region, is something The HillVille wants to be a part of and celebrate. We want to showcase the urban pioneers, restaurants, breweries, businesses, galleries, spaces and plans that make our cities great. We also do not want to overlook or short change another important urban Appalachian population: ex-Apps and exiles. We know just as many urban Appalachians live outside the region as they do in it. Our people have been moving in and out of nearby metropolitan centers like Atlanta, Nashville and Baltimore for more than two centuries. And of course, there was the Great Migration. From 1940 to 1970, seven million Appalachians flooded Mid-western cities looking for factory work. Largely young, poor and uneducated, they settled in tight with their own, creating distinctly Appalachian neighborhoods like Chicago’s Uptown, Cincinnati’s Over-the-Rhine and Price Hill, Dayton’s Fifth and Wayne and Detroit’s Cass Corridor. It was from that movement the phrase “urban Appalachian” was born. It’s always been most active and successful in Cincinnati, which famously boasts a law barring discrimination against Appalachians and the Urban Appalachian Council, a social service organization that’s been operating for 40 years. That great generation has mostly moved up and out from their initial neighborhoods. They’ve gotten older and had kids and grandkids who may have never laid eyes on the hills of back home or talk with a twang. Still, they carried with them mountain ways that linger yet and have fused with each city’s culture. The HillVille can’t wait to explore these places, finding mountain in their midst. A mural depicting Appalachian migration adorns the Urban Appalachian Council building in Cincinnati's Price Hill neighborhood. The truth of it is, we Appalachians are everywhere, just as Jeff Biggers so exceptionally demonstrated in his book The United States of Appalachia. We know what longing and homesickness is, and how uniquely bothersome such feelings can be to an Appalachian soul. We hope we can be a virtual touchstone, a place where ex-Apps can refresh themselves with content that captures Appalachian culture, but is crafted especially for city dwellers’ tastes. For more than half of us, to be Appalachian is to be urban, or even more likely, suburban. Our mental maps of our communities’ cul-de-sacs and thoroughfares, main streets and town centers, lay astride our Appalachian identities, creating a geography of the heart that is real and imagined, given and chosen. The HillVille is here to claim that space, to recognize and give rise to it. We are here to tell our stories so that we may know ourselves better, individually and as a collective, so that a truer version may emerge. Together, we’ll discover what it means to be urban Appalachian. Niki King is co-publisher of The HillVille. Sources: Appalachia: Social Context Past and Present and Encyclopedia of Appalachia. Map reprinted with permission from University of Tennessee Press. I’ve noticed alot of cities have been turning old factories into condos and apartments….better than letting them go to waste. Thanks for the lead on further reading–we actually love homework assignments. This is really exciting! It’s great to see Urban Appalachia begin to be recognized. And you’re right; Appalachian Studies does tend to focus on rural Appalachia, but I think the tide’s beginning to shift. At least I hope it is! I can’t wait to see where the conversations here will go! Thanks so much Marc! If you ever have ideas or suggestions, please do share them with us. We’d love to have them. You might also consider the interplay of rural and urban in areas of rural Appalachia where back-to-the-landers settled in the 1970s. The back-to-the-landers washed ashore in the 70’s. The tide took carried many of them back to where they came from, but many settled and set roots in their communities. The interplay continues. It would be a very interesting area of study. Have you researched the Boone NC Area?